The Tama Lakes track starts and finishes at Whakapapa Village. 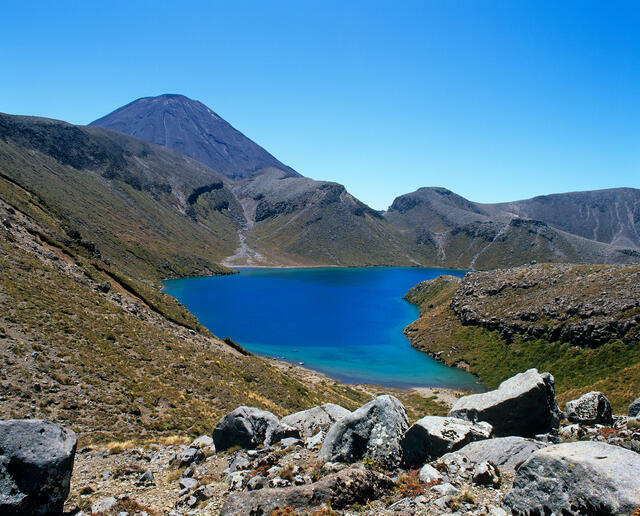 The lakes are located on the saddle between Mt Ngauruhoe & Mt Ruapehu. The Tama Lakes hike branches off the Taranaki Falls loop track. I prefer to hike/run Taranaki Falls clockwise because the second half of the track is higher than the first half. This means you can enjoy long ranging views out to the North and West. You can see Mt Taranaki on a fine day. If you choose to hike clockwise, take the track entrance on your left going up Ngauruhoe Terrace. It’s well sign posted for Taranaki Falls & Tama Lakes. Approximately an hour in you'll come to the Taranaki Falls. After a steep little climb to the top of the falls you will arrive at an intersection sign posted Tama Lakes. Follow the track to the Lakes. From this point the track is an out and back hike. When you arrive back at the Taranaki Falls you can take the upper track back to Whakapapa Village. At the Lower Tama Lake you can choose to continue up to the Upper Tama Lake. The elevation change from Whakapapa to the Lower Tama Lake is about 200m. To reach the view point for the Upper Tama Lake you’ll climb a further 100m up a steep 1.5km ridge. This ridge can be a challenge in strong winds. The section from Taranaki Falls to the Tama Lakes is “out and back” which means you cover the same ground. Obviously there’s a different perspective on the way back. This track starts in the Rangipo Desert located on eastern side of the Tongariro National Park and finishes at Whakapapa Village. The best way to organise this hike is to park your car at Whakapapa and take a shuttle to the Desert Road start. And walk back to your car. There are spectacular views of Mt Ruapehu & Mt Ngauruhoe from almost the entire hike. On a fine day of course. The track passes through a variety of vegetation including tussock grass, snow grasses, alpine herb fields and some beach forest. 6.3km into the hike is the Old Waihohonu Hut. This hut was built in 1903 and was once used as a stop over for stage coaches travelling from Wanganui to Tokaanu. It’s no longer used as accommodation. The track climbs gradually from the start to the Lower Tama Lake saddle. An easy 300m climb. The descent to Whakapapa Village is 200m. From the saddle you have the choice to climb a further 100m over 1.5km to the Upper Tama Lake. See the Tama Lakes hike for more information on the section of track from the Upper Tama Lakes back to Whakapapa Village. So why would you choose this hike over the Tama Lakes hike? You’d choose this hike if you prefer a point to point hike rather than an out and back hike. Starting in the Rangipo Desert with views of the volcanoes from the east also adds variety. This is a good option when it’s raining but you're still keen to get out and enjoy the nature. And why not if you’ve got good rain gear! The idea with this option is to string smaller hikes together. If the weather gets too bad you can bail out. Or call into a cafe at Whakapapa for coffee to keep you going. Each hike is between 1.5hrs to 2hrs. Taranaki Falls and Silica Rapids start at Whakapapa Village. 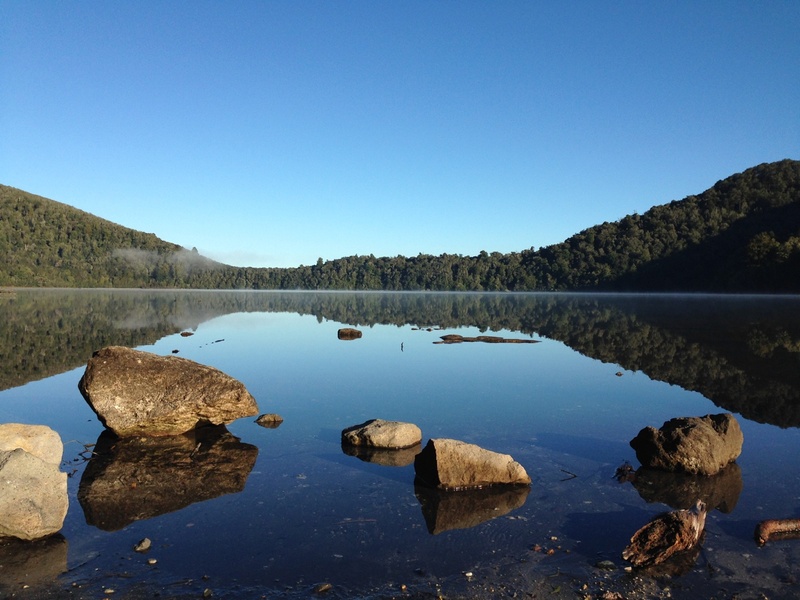 Lake Rotopounamu is located off State Highway 47 towards Turangi about a 20 minute drive from Whakapapa. For personal reasons Lake Rotopounamu is one of my favourite places on this planet. After hiking Lake Rotopounamu you can choose to drive down to the Tokaanu Hot Pools. This scenic drive will take less than 10 minutes. 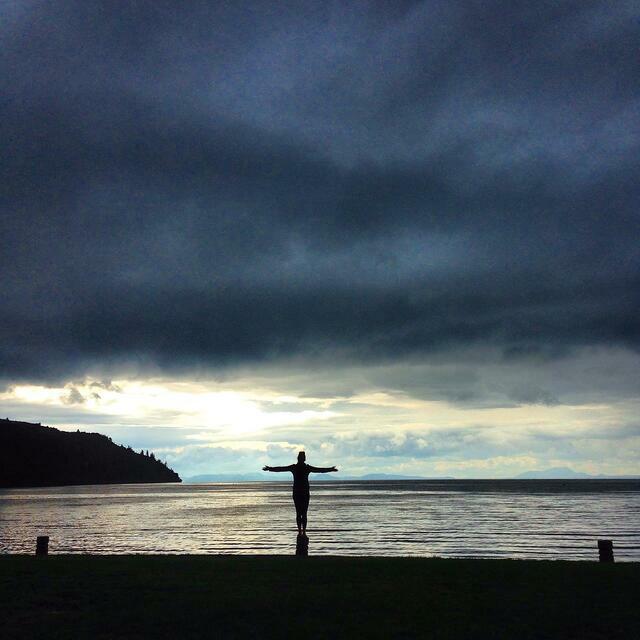 Lakeland Cafe is a 2 minute drive from Tokaanu on the shores of Lake Taupo. This is one of the best locations of any cafe in the Central North Island! Parking is at Whakapapa Village (See Tama Lakes description for parking). I like to walk this track clock wise because the second half of the track is slightly higher. Which means you can enjoy long ranging views to the North and West hiking back to Whakapapa. To hike this track clockwise take the track entrance on your left going up Ngauruhoe Terrace. It's sign posted. The track finishes about 15m further up the road. One of the highlights of the walk is the Taranaki Falls which crashes down over a 15,000 year old lava flow. Another highlight is the variety and the views of surrounding volcanoes. This walk is enjoyable in any weather. Parking is at Whakapapa Village. I recommend walking this track clockwise. It’s a loop track with a 2.5km section of road. If you hike clockwise you walk the road first and then finish off through the nature. From the Village walk up the road leading to the Whakapapa Ski Field. After about 2.5 km you’ll see a small car park on the left. You’ll see the track entrance opposite the car park. Like the Taranaki Falls this track has a lot of variety. You walk through tussock country, subalpine vegetation, swamp country and beach forest. You’ll pass by crystal clear mountain streams. 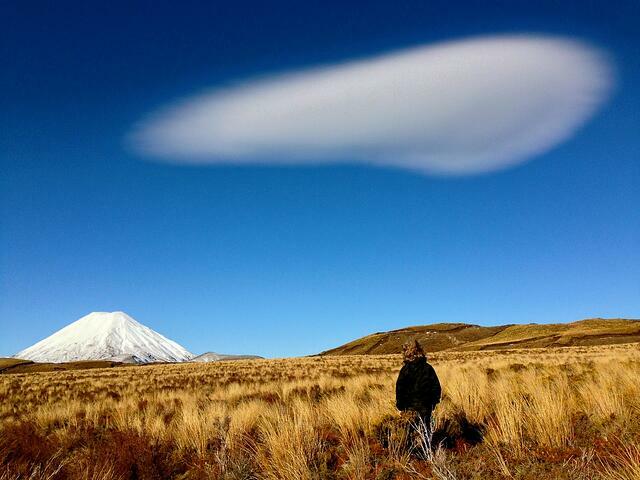 On a fine day you’ll enjoy beautiful views of Mt Ngauruhoe & Mt Ruapehu. The Silica Rapids make this track unique. The spring water rushing over the Rapids looks milky because of silica deposits on the stream bed. This hike is about 25 minutes drive from Whakapapa. To get there from Whakapapa head back down SH 48 and turn right at the SH 47 intersection. Stay on 47 until you reach the car park for the hike. The track starts opposite the car park. It starts off quite steep until you reach the lake loop. I like to do this loop anti-clock wise as there're nice sandy beaches to enjoy on the second half of the hike. The Lake fills a crater and was formed by a land slide about 10,000 years ago. The lake is surrounded by podocarp forest. It’s home to a good number of native bird species including Kaka, North Island robin, NZ Falcon, and Kakariki. From Rotopounamu it’s a short 10 minute drive to the Tokaanu Hot Pools. Head towards Turangi on SH 47 and turn left at the SH 42 intersection and follow the signs. From the hot pools car park you cross a small bridge over the Tokaanu Stream. You can often see trout from the bridge. There's a small loop track behind the hot pools I recommend. The track takes you through a natural thermal area. You’ll see hot mud pools, steam vents and hot water pools. The loop takes less than 20 minutes. At the hot pools you have the choice of the public pool or private pools. The private pool is cheaper but is treated with chemicals. The private pools are pure and natural. Very relaxing. The private pools have a covered area to get unchanged and a place to keep your clothes dry. There’s no roof over the pool so plenty of fresh air. Nice and refreshing when it rains. The place is a little dated. Some people might not like this. I personally think it adds to the authenticity of the place. This restaurant cafe is tucked away on Waihi Road off State Highway 47. To get to Waihi Road travel about 1.5km North West from Tokaanu and follow the signs. This little cafe restaurant is a gem. One of best locations of any cafe restaurant in the central North Island. The team are friendly and the food is great. It’s a peaceful and beautiful location. It is a little expensive if you’re on a tight budget. If you are, I still recommend visiting even if it’s just for tea or coffee and delicious cake. One of my favourites. 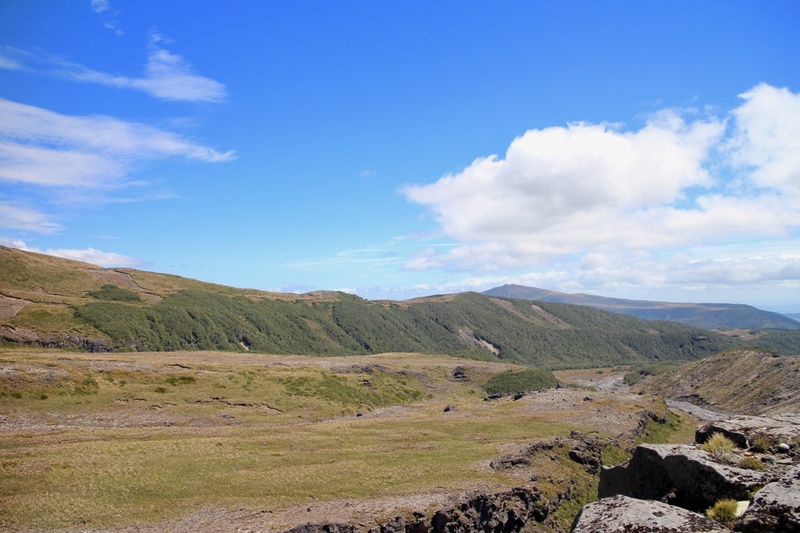 This hike starts just below the Iwikau Village near the Whakapapa Ski Field. You need a shuttle for this one as it's a point to point hike. This track is not maintained to the same standard as the Crossing or the Tama Lakes hike. This can be a refreshing change for those who appreciate wild and untouched nature. The track is polled and sign posted so there’s no problem navigating it. There's a stream crossing on this hike. It’s possible to boulder hop over the stream at normal levels. After rain it'll pay to ask a local mountain expert for advice. There are two ways you can do this hike. Park your car at Discovery and Catch a shuttle to the start. Hike down the mountain to Mangahuia Camp Site and then walk the 1.7 km along SH 47 to Discovery. The second half of this route can be very wet and muddy under foot, especially after rain. 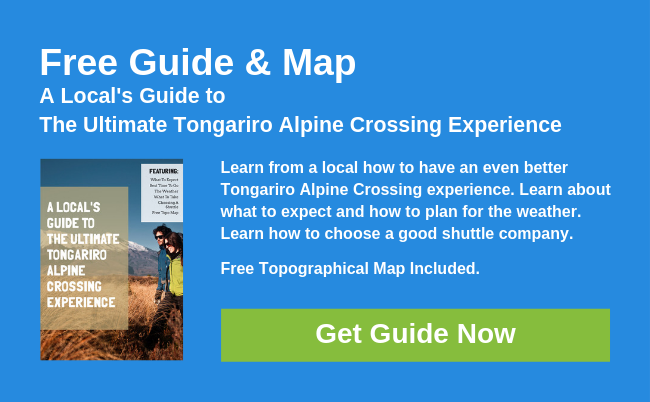 Park your car at Whakapapa Village, catch a shuttle to the start and hike back to your car. Most of the second half of this option is through beach forest. This track is in better condition compared to the second half of the Mangahuia route. Quite a rugged track with a stream crossing. This is a plus for adventurous souls. This hike starts just below the Iwikau Village near the Whakapapa Ski Field. The same starting point as the Whakapapaiti Valley hike. The track finishes near the top of the Mountain Road below the Turoa Ski Field. This hike is a good challenge for experienced hikers wanting to get away from the crowds. A true wilderness experience. This track is not maintained and is a polled route. There are numerous stream crossing although most are small streams. There are multiple climbs and descents. It’s a point to point hike and requires a shuttle pick up or drop off. Highlights of this hike are the stunning river valley crossings, the water falls over old lava flows at the top of the Whakapapaiti Valley, Lake Surprise, The Cascades and all the amazing views. A rugged track with multiple stream crossing. Also a plus for adventurous hikers.